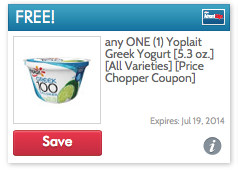 Price Chopper: FREE Yoplait Greek Yogurt, PC Matchups + Scan Your Card To Possibly Recieve Free Item Coupons!! Make sure you clip the ecoupon above for a free Yoplait Greek Yogurt at PC this week! Plus, scan your AdvantEdge card at PC thru 8/9 - lucky shoppers will receive coupons for free items! There are two coupon inserts this week - a RP & a SS. I'm back from vacation so will post the full PC weekly matchups tonight or early tomorrow morning.